Hanoi (VNA) – As many as 100 43-inch smart TVs, worth over 1.6 billion VND (70,400 USD) in total, will be awarded to Vietnamese gold medalists at the 29th Southeast Asian Games (SEA Games 29) to take place in Kuala Lumpur, Malaysia, from August 19-30. The sponsorship programme was signed by Nguyen Kim Trading Joint Stock Company and Samsung Vietnam in Hanoi on August 11. 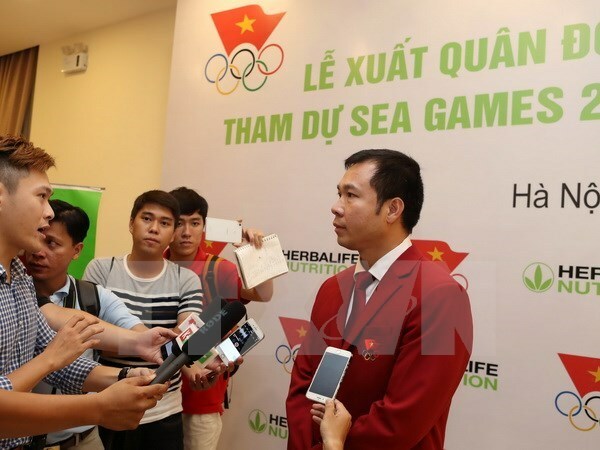 Tran Duc Phan, head of Vietnam’s SEA Games delegation, said Vietnamese athletes are expected to win between 49-59 gold medals, adding that the gifts will create a great motivation for the athletes. Meanwhile, Tran Van Manh, Secretary General of the Vietnam Olympics Committee (VOC), lauded the timely sponsorship and encouragement of sponsors, saying that Vietnamese athletes had promised to do their best to earn gold medals and bring glory home. VOC has so far received support from 11 sponsors for the Vietnamese sport delegation to SEA Games 29, he added. According to the organizers of SEA Games 29, the event will draw around 6,000 athletes from 11 nations in Southeast Asia, competing in 38 sports with 405 categories.